Well, fear not because I was in your same situation just months ago. Following a bunch of surfers and people who live in Hawaii, Brazil and Australia helped introduce me to what açai bowls are. Actually, a few years ago, I went to a health expo held at a mall near me and received a free bottle of Sambazon Açai Superfood juice. And at the time, the taste was so different I wasn’t sure I would like it. Little did I know that I would become obsessed with açai in just a few years. Flash forward to a few months ago. 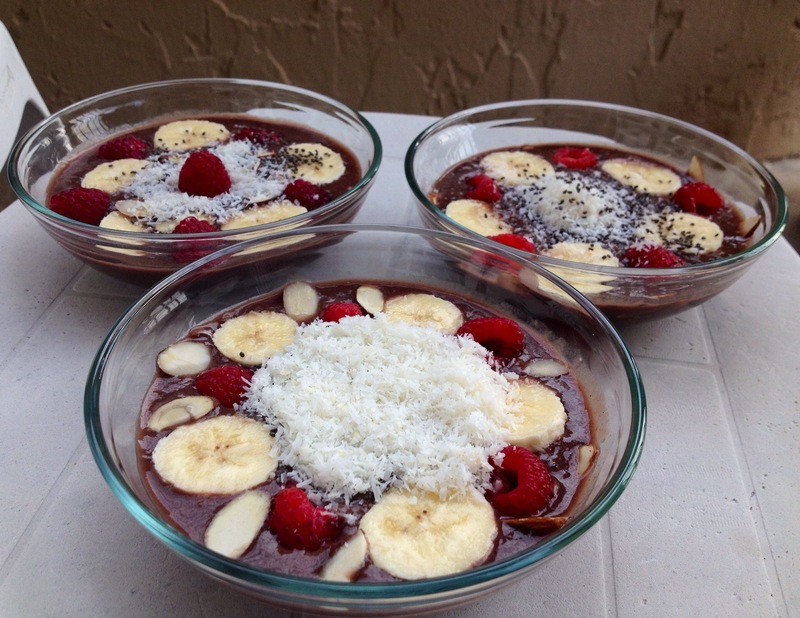 I kept seeing images of these beautifully made açai bowls. Yes, nicely arranged food is beautiful! It looked like a smoothie with all kinds of fruits (such as bananas, raspberries, goji berries, blueberries, strawberries, etc.) with various nuts, chia seeds, and coconut flakes on top. Açai berries are a “grape-like fruit harvested from acai palm trees, which are native to the rainforests of South America” according to Mayo Clinic, and it “can be consumed raw, in tablet form, in beverages such as juice, smoothies or energy drinks, or in other food products such as jelly or ice cream.” Many people are not only attracted to the taste of açai, but also to the health benefits of consuming the berry. The Sambazon website mentions that the super fruit contains many antioxidants and healthy fats without containing any sugar. Want an açai growing palm tree yet? I sure do. Now that you’ve got a little background on just what açai is and know how to pronounce the word, it’s time to make an açai bowl (if you haven’t already). I’ve found it hard to find the açai berries, powder, or smoothie packs (individual serving sizes of blended açai- ready to put in a blender with other ingredients or just by itself) in some grocery stores. However, Whole Foods Market has some versions of açai and I’m sure many local farmers markets or specialty grocery stores will have açai in stock. You can always purchase açai bowls made-to-order when you want to stop for a nice light, yet satisfying snack or meal with friends. Since açai is not extremely popular, you may realize that it can be challenging to find a shop that makes açai bowls. However, I have found that local farmers markets may make the bowls along with some “cafes” opening that also serve the bowls along with juices and super food products. Often times buying a bowl at one of these places will be expensive, or more costly than making the bowl at home. I have seen places charge from $6-$10. And if you are a super-fan of açai, buying bowls can add up quickly. The little red berries in the middle are goji berries. This was called a “tropical bowl” and had pineapple, coconut, raspberries, chia seeds, and more. If you find yourself craving açai but not able to continually purchase a bowl, or not able to drive to an açai bowl-making shop without having to drive 300 miles to find one, than settle for making one at home. Making an açai bowl is really simple and fun and provides for a nice opportunity to do a little food photoshoot and upload some pics to Instagram. My friends and I used individual packs from Sambazon (the package contained 4 individual packs) and followed the instructions on the package, which required some liquid (either coconut water, plain water, almond milk, or whatever you prefer) and a frozen banana. Some people add spinach or kale or other ingredients in the bowl also. Once the ingredients were blended, we added the toppings. If you decide to use açai powder or berries, there should be directions on the package detailing how to make the smoothie. However, if there are no directions on the package, here is a recipe if you use açai powder and another recipe if you use the açai smoothie packs. I could go on and on with the list of toppings- there are just so many! But that’s what I love about açai bowls…you can make them totally unique to your preferences. The Sambazon website even has some awesome recipes to make with the açai smoothie packs, so it will be a challenge to get bored of açai. What’s your favorite açai bowl combination? These recipes look so good!!! I will make one for breakfast tomorrow!